It's all about dogs and water creatures this week, as one dog finds weed, another dog is saved, and various aquatic creatures terrify us. Dickie, a 2-year-old Belgian Malinois/German Shepherd and the Sonoma Police Department's newest cop, reportedly sniffed out 50 pounds of pot sealed in vacuum-packed plastic bags, along with more than $14,000 in cash. His nose led to the arrest of 40-year-old Jeremiah Soria, who also had an outstanding Hollywood warrant. The above photo is real. 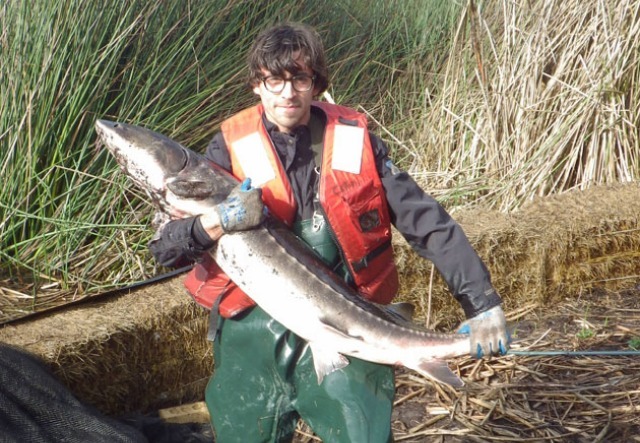 That's SF State grad student Jonathan Young, who's tasked with plucking predatory and invasive creatures from San Francisco's Mountain Lake, and sending them to live out their days in vineyards in Napa and Sonoma. He's also found a massive carp and, is that a catfish? Get this: Young says that he once caught a sturgeon even bigger than the one in the photo, but it "got stuck in the net and ripped itself out. Who knows what’s lurking down there." (Emphasis ours) Sleep tight, y'all. Oreo!!! How the hell did you get stuck on that cliff? Now the Sonoma County Sheriff's Department will have to call 'Henry-1' in, a deputy will have to dangle 100 feet below the helicopter (yet far above the pounding surf), and you'll have to be pulled back in to safety! OK, I'm sorry I yelled at you, you're a good boy. I was just worried for a second, the above video is pretty scary! I'm glad you're safe. What the heck are these jellyfish doing in a lagoon at Redwood Shores? According to the noted oceanographers, at KRON, they're supposed to stay in the ocean, which makes the above video taken by Marygrace Barron all the more confounding. Between this weird jellyfish behavior and those insane fish, hug your children, I'm pretty sure it's end times.